There are a lot of towns in Illinois that produce Civil War Store Cards with the majority being produced in Chicago. Although some are scarce, these tokens are readily collectible. 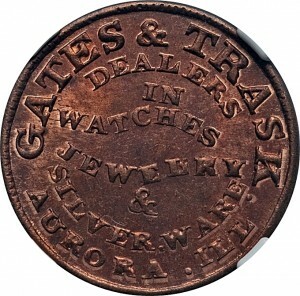 Many of the tokens produced in Chicago were made by the shop of S.D. Childs. Those produced by F.N. Dubois typically make use of reverse die F-1368 in the years 1859 and 1860, but they have been listed in so many references as Civil War Store Cards that they continue to be considered part of that group of tokens.